Despite a successful implementation of the Central European Free Trade Agreement (CEFTA), providing for zero tariff for trade across the region, trade within the CEFTA region is still impeded by numerous non-tariff barriers. Excessive and redundant trade-related procedures, overlapping compulsory document and data submission requirements for companies, as well as excessive physical inspections at the borders are amongst them. This makes trade in the region more time consuming and expensive. As a result, many companies are denied opportunities to expand through trade. 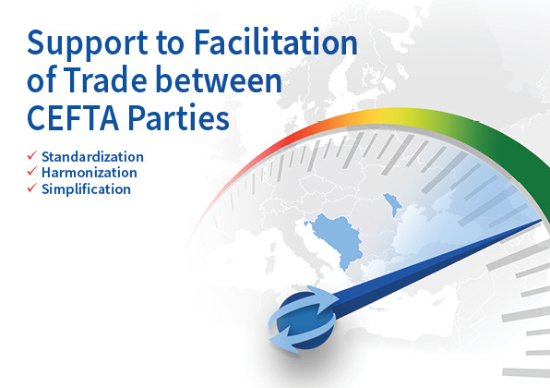 The objective of the Project is to rationalize and simplify trade-related procedures and documentation specifically by providing support to the implementation of the ‘Additional Protocol 5 on the Facilitation of Trade’ to the CEFTA Agreement. It is essential that the public and the private sectors work together in identifying the existing obstacles to trade and developing appropriate measures to eliminate such barriers. Given that companies in a specific sector tend to face common barriers and challenges, the project takes a sector-specific approach, focusing on two sectors that are of particular economic relevance for the region. The necessary link with the private sector will be achieved by setting up Regional Business Advisory Group (RBAG), aimed at providing the business community with an important voice in communicating obstacles of trade to the public sector.